Greetings from PROLITE AUTOGLO. We are a one stop shop for emergency/egress lighting solutions and photoluminescent signages of all types, shapes, sizes and uses conforming to existing and acceptable standards. We enjoy the patronage of most 5 star hotels, major malls and government organizations including atomic power facilities, NTPC etc. Our clients list is a virtual who’s who of the cream of the cream but we also enjoy the confidence of scores of industrialists, businessmen, builders, architects etc. 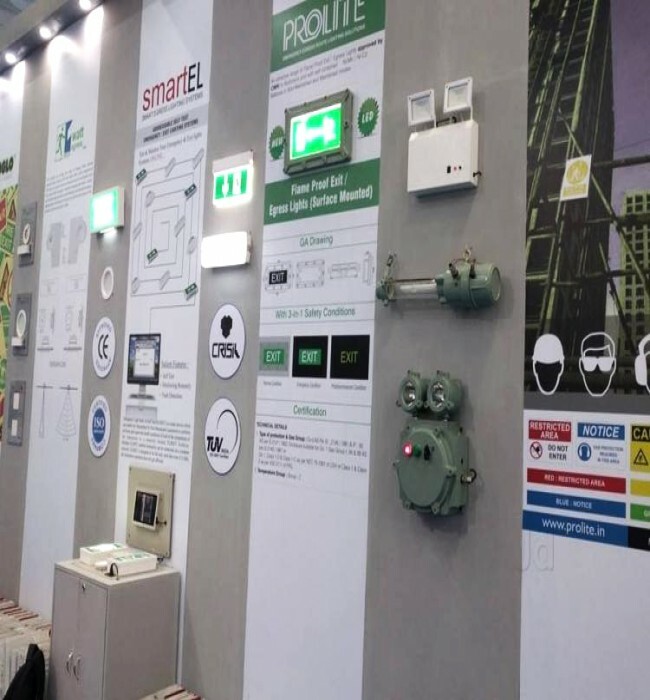 due to the strict quality control and after sales services that we provide in the manufacture and maintenance of our emergency light and signage ranges. The saying ‘Ignorance is Bliss’ certainly does not hold good when it comes to safety and security. In fact, the saying “Knowledge is Strength” is far more appropriate. We are in a new age where existential threats have newer add-ons in the shape of sabotage, terrorism, hacking etc. We are constantly under their shadow in our place of work on roads, alleyways, streets and even in our homes. Disaster can strike in the shape of blackouts, fires, external attacks, accidents etc. without warning. We are in the business of manufacturing products that will help people trapped in such situations and guide them to safety by illuminating the closest possible exit routes even in pitch dark or smoke screened conditions with adequate protection from slipping or bumping into objects. We essentially live the maxim “prevention is better than cure” in our work and all at very reasonable prices to suit all budgets. Did you know that the measure of light intensity is known by the term ‘Lux’? And that there is an instrument available that actually measures this? Did you know that 1 Lux is the unit measure of the intensity of moonlight that shines on the earth on a full moon night? Did you know that the measure of light intensity on the floor is the determinant and not that on any raised surface such as a table or a chair? And that the difference between the two can be huge? Did you know that any new building or construction, and even in cases of older ones, it is mandatory to have in place proper safety paraphernalia in line with existing regulations in terms of emergency lighting and signages beyond just fire extinguishers and panic buttons? Did you know that there are tried, tested and scientific reasons even for the colors chosen for EXIT signs and other safety related photoluminescent signages, maps or floor lights? And that in heavy smoke or pitch darkness certain colors are more easily and clearly visible than others, and that this is also a parameter that goes into designing signages? Did you know that emergency lights and proper signages conforming to safety standards mandated by the requisite authorities must be installed failing which legal consequences may follow for the builder/developer and all people of responsibility down the line? Did you know that some of the most renowned architects and construction honchos, even today, are not aware of the bare minimum mandatory safety regulations that cover their own buildings /constructions/creations and that in case of any fire or accident, they could find themselves personally legally culpable? Did you know that most people commonly see emergency lights and signages etc. as irritable and unnecessary expenses and prefer to save money not realizing that it could not just land them behind bars but could also be the cause of loss of lives and limb, not to mention property and belongings? Did you know that we at PROLITE offer free site survey on the basic minimum requirements in terms of signages that need to be installed in any building, office block, hotel, restaurant, mall, multiplex, housing society or other closed premises and also offer multiple choices in the best of product ranges for all? Did you know that if you are a house owner, builder, developer or estate consultant and need the knowhow, we are always just a phone call or an SMS away. All we would need would be the requisite floor plan or construction maps based on which we could identify and mark out the locations of the signages or even the lighting solutions and offer the best quotation for the same. Did you know that once you have installed PROLITE AUTOGLO’s ranges in your premises you can rest assured that you are adequately protected from any unfortunate eventuality that impairs vision or poses risk to life and limb for a long time to come. Also, you are assured of prompt after sales service by our team of qualified and competent engineers and field personnel who are there to serve customers and build relations too?